You’ve got a busy day and night ahead but only one outfit. And you don’t need sweat, odour and marks as accessories. Sure Women Invisible Antibacterial anti-perspirant deodorant offers a unique formula which combats sweat, odour and marks so you can feel fresh, dry and protected all day long. With up to 48 hours of protection, sweat won’t get in your way. Neither will anti-perspirant deodorant marks – our best ever anti-marks formula protects your clothes on every level. Black clothes are protected from white marks and white clothes are protected against yellow stains. The best way to beat body odour is to fight the source: bacteria. This anti-perspirant deodorant tackles odour at the source by eliminating odour-causing bacteria. The only smell you will be left with is a fresh and fruity fragrance of pear and berries. 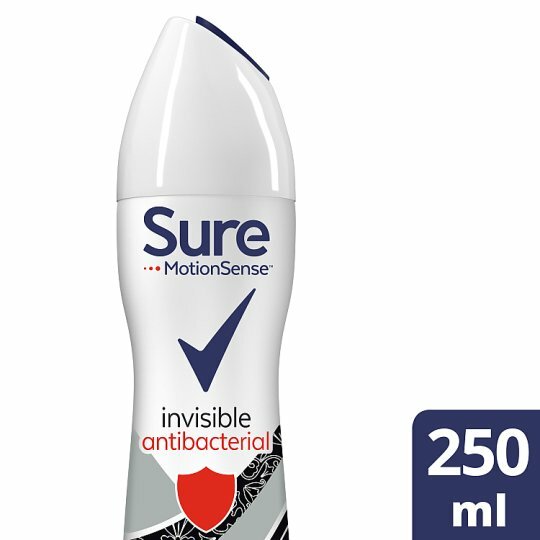 Sure Women Invisible Antibacterial anti-perspirant deodorant contains innovative Sure MotionSense technology which releases a bursts of fragrance when you need it most. It works like this; unique microcapsules sit on the surface of your skin. When you move, friction breaks those microcapsules and they release more fragrance. So the more you move, the more it protects. So, get all day freshness and 48 hour protection against sweat, odour and marks with Sure Women Invisible Antibacterial anti-perspirant deodorant. How to use: Firstly, shake the Sure Women Invisible Antibacterial anti-perspirant deodorant can. Then hold it 15 centimetres away from your underarm and spray evenly in a well ventilated area. Avoid contact with eyes and broken skin. Shake well, hold can 15cm from the underarm and spray. Avoid direct inhalation. Use in short bursts in well-ventilated places, avoid prolonged spraying. Use only as directed. Do not spray near eyes. Do not use on broken skin. Stop use if rash or irritation occurs. Keep out of reach of children. Do not pierce or burn, even after use. Pressurised container: May burst if heated. Protect from sunlight. Do not expose to temperatures exceeding 50°C. Do not spray on an open flame or other ignition source. Keep away from heat, hot surfaces, sparks, open flames and other ignition sources. No smoking.